"He just played the best game he has all year," Brady said. "So proud of him (and) what he's accomplished coming back from his ACL (injury). He just fought it out, grinded it out just like everyone else." 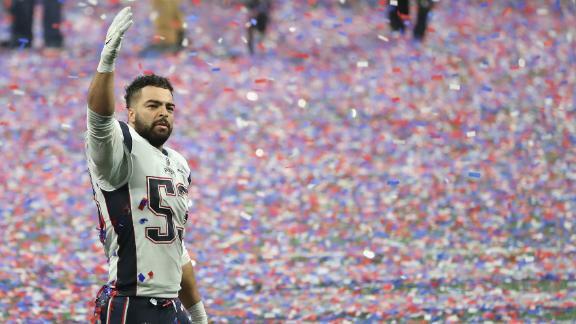 With 16 total points, it was the lowest-scoring game in Super Bowl history, and the Patriots' 13 points is the lowest by a winning team in a Super Bowl. It's also the first Super Bowl without a touchdown through the first three quarters. A Stephen Gostkowski 42-yard field goal was the only scoring in the first half. The 3-0 score was the second-lowest scoring first half in Super Bowl history. Only Super Bowl IX, when the Steelers led the Minnesota Vikings 2-0, was lower. Rams kicker Greg Zuerlein's 53-yarder tied it with 2:11 left in the third quarter. It started with a completed pass to tight end Rob Gronkowski for 18 yards. The crowd, which was majority Patriots fans, started chanting, "Brady! Brady!" Brady then hit Edelman and Rex Burkhead for 13 and seven yards, respectively. Another throw to Gronkowski for 29 yards set up first-and-goal from the 2-yard line. Sony Michel ran it in from there for the touchdown with seven minutes to go. The drive was five plays, 69 yards, and it took two minutes, 49 seconds, in which Brady went 4-for-4 for 67 yards. "That's my fault," Goff, in his third year at age 24, said of the interception. "I can't put us in that situation. I knew they were bringing cover-zero blitz there, and I tried to hit Brandin (Cooks) on a go-ball, and Gilmore was too far off for me to make that decision. It was a bad decision by me, and I have to do better." "Coach Belichick did an outstanding job," McVay said. "There is really no other way to put it. I'm pretty numb right now, but definitely, I got out-coached. I didn't do nearly good enough for our football team. The thing that is so tough about all of this is the finality to it. "Usually, you get a chance -- if you go through some adversity, you can bounce back right away. This one is going to stick with you and it just stings in your gut."